As a modern dentist office in Orange, CT, we have hundreds of patients who are employed by Yale University or the Yale Hospital System. 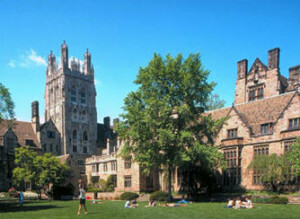 We accept all the Delta Dental Insurance plans offered by Yale University to their employees. We are experts in the specific Yale dental insurance plans and process claims promptly and efficiently. We are a modern, clean, and friendly dentist office located only ten minutes from the New Haven campus. Our convenient weekend and evening hours give employees, and especially YNHH residents, the flexibility to see us when most other dental offices are closed. We offer comprehensive dental services, from simple cleanings to pediatric procedures to fillings to dental emergencies. Below are descriptions of the variations of the dental plans we encounter. One of our many YNHH resident patients at a recent visit with Dr. Nick Calcaterra. 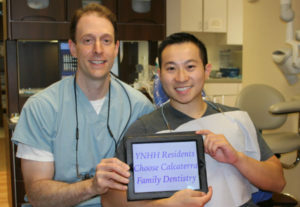 We feel privileged to provide comprehensive dental care to employees within the Yale New Haven Hospital system. Our patients include medical residents, nursing staff, physicians, and other key personnel. Over the years, we’ve seen hundreds of residents in the YNNH Hospital system. We’ve seen some throughout their entire residency. Why? We offer convenient hours and understand that residents have very demanding schedules and know how to accommodate them. In fact, see this post on how we’ve had over 100 visits by YNNH medical residents alone in 2016! Medical residents have a very specific plan (aptly called House Staff) while non residents have another dental plan (called Non House Staff). While coverage levels vary somewhat, you are able to maximize your insurance benefits by coming to our office, as we are “in network” or “participating providers” with all the variations. There are two major variations of the Delta Dental insurance plan that we see in our Orange, CT office: union and non-union plans. Both are through Delta Dental of New Jersey. We take or participate with both plans. The differences largely amount to the yearly maximum, the treatment of white fillings on posterior teeth, and other smaller variations.